Thirsty Pilgrim: Brussels Grand Place to Welcome Hard Rock Café, Then Jump a Shark. Brussels Grand Place to Welcome Hard Rock Café, Then Jump a Shark. I was working on a long post breaking down this recent Bloomberg piece, which declares that "Brussels is for foodies." Which is true. It recommends 10 nice-looking and mostly expensive places to eat. I was going to show how few of them really give a damn about beer, which ought to be shameful in Belgium's capital. But there is no news in that. Then I came across something really and truly shameful, and it put the other stuff into perspective. The news is that there will be a Hard Rock Café in Brussels -- and not just in Brussels, but on the Grand Place. I checked the date. April Fools? No. But is it really a done deal? It would appear so. We should not be surprised. The Grand Place -- one of Europe's most impressive city squares -- has been bogged down with tourist traps for years. They have indifferent service and overpriced, mediocre food. They hang old beer signs and give a superficial nod to the country's brewing tradition, and then stock nothing interesting beyond a couple of Trappists. Fine. At least they look the part. They are still brasseries and uniquely Belgian, even if we knew better places with better prices a few blocks away. But the Hard Rock? Really? Has Brussels lost its mind? And now those of us --locals and foreigners alike -- who have labored to tell Brussels that it ought to have dignity, that it deserves some, are left to ask ourselves: Did it ever have a chance? Have we been wasting our time? "In addition to its food, Hard Rock offers unmatched specialty drinks from its award-winning bar menu, from Hurricanes and Margaritas, to its Alternative Rock non-alcoholic beverage menu featuring favorites like Wildberry Smoothies and Crushed Velvet 'martinis.'" Oh my. The address is Grand Place 12a, up in the southern corner. This building is also known as the Roi de Baviére (the "King of Bavaria"). Note that this is not the same building as Grand Place 12, which is two doors up from the Brewers House in the building known as the Maison du Mont Thabor. Number 12a is just across the mouth of Rue des Chapeliers, adjoining the Dukes of Brabant, next to 't Kelderke. You can see a map with addresses here. 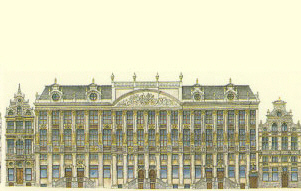 In the picture above, 12a is the lower building on the far right. A nice place for some Hard Rock neon, right? The Grand Place is a UNESCO World Heritage Site, and there are local protections that apply. The Hard Rock might have to leave the facade relatively intact, and may face restrictions on the aforementioned neon. According to news reports, a private investor owned the house and negotiated an 18-year lease with Hard Rock. If the company follows the same rules as everyone else on the Grand Place, it's hard to imagine how the authorities could or even should discriminate based on a history of tackiness. But you never know. The locals love a good protest, and maybe this will stir them up. I'm sure there must be a class of tourist that would be happy about this, otherwise it would not be possible. Just don't blame the Americans: It's been 20 years since I met a fellow American who was excited about seeing a Hard Rock Café. And that person, I believe, had only recently hit puberty. Meanwhile, Brussels says it plans to turn the Bourse into a national beer museum by 2014. I'd expect heavy support from A-B InBev, and all that such support would entail. The article says, "Unlike the Netherlands with their Heineken Experience, Belgium only has a number of small beer museums." As if that were a bad thing. About the museum: The Flemish politician says something that says too much about much Flemish political thinking: "The fact that we have a special glass for every beer, with artisanal breweries tucked away all over the place is extremely charming for our Dutch visitors. Beer is a science in which we excel, and it could be perfectly showcased in a museum like this one. 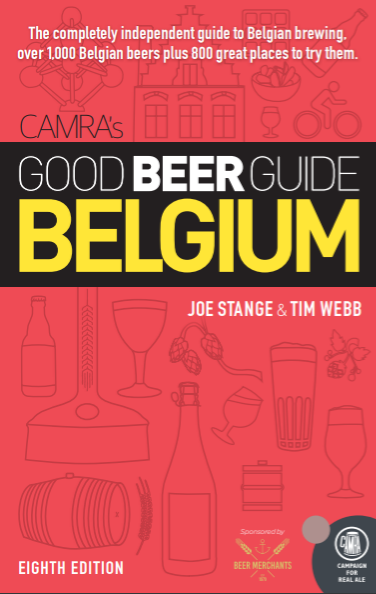 We feel the stock exchange is a prime location, even though 65% of all Belgian beer is brewed in Flanders." See how he worked that last bit in? Absurd. Nevermind that Wallonia has only one-third of the country's population. But him singling out the Dutch tourist is interesting. Will the Dutch tourists who find the special beer glasses and little breweries "charming" think the same thing about a Jupiler museum? And what will they think of the Hard Rock? Finally, I have to note that Hard Rock's European operations VP, Calum MacPherson, said that the company hopes to make it an "essential gastronomic destination" in Brussels. And there, ladies and gentlemen, is your perspective. Sad... I think I need a beer. Thanks for such a great write-up about this ridiculousness. There was a collective groan from most people who live in and love Brussels when it was announced, and I actually have yet to hear a Belgian talk about the Hard Rock Cafe in its favor. Most people have laughed it off, talking about how much of a disgrace the one in Antwerp was a few years ago. There's been this shrug off about this new development, where the Belgians I've talked to at least sort of conceding that it was inevitable until a globalised brand took over the GP (and granted, they are Belgians who live in Brussels, so they don't necessarily make up the status quo). But there has been a general sense of confusion as to how the first Bxl Starbucks ended up in Gare Centrale and not the Grand Place, so it feels like Belgians were expecting something like this to come for some time. But anyway you cut it, it makes me sad. I'm trying to sort out why Hard Rock Café annoys me more than Starbucks would have. Maybe it's because Starbucks is popular for a reason... it does something useful and does it well. The Europeans I know treat Starbucks much like Americans do: We say, "What another f*****g Starbucks, really?" And then we go inside for a coffee. But the Hard Rock... I mean, who goes there? Maybe I shouldn't judge, since I haven't been there since I was 12, but it's a mass exportation of American tourist-trappery. Central Brussels has more than enough of its own brand of tourist-trappery. It's clumsy, but at least it's ostensibly Belgian. I don't know. Maybe the Americans are coming to show the Rue du Bouchers mafia how it's done. And about Starbucks....pffff.... In Prague I can get coffee that is at least half as good and perhaps even cheaper and won't have to queue for it, they'll bring it to my table in a proper cup. (but this is off-topic, of course). Ugh! I'm with you on the Starbucks. But Hard Rock...ugh. I hate looking at them in the US. A little off topic, but I was at the light show in Gent a few weeks back and I was surprised to see how many people were in the McD's. In fact, I'm always surprised to see just how busy they are all over Europe. The global chain food empire has begun. If the people of Brussels are incensed enough they could close this place in no time. A few protesters with placards outside shouting slogans in French and Flemish will keep the tourists out and the place will die in the vine. well, doesn't surprise me one bit. I say its typically belgian. I also won't be surprised if they ever turn the Grand Place into a parking lot like in most Belgian cities / towns. Hard Rock Cafe will go up. Many will complain but then they will go to it once. After 5 years it will go out of business. Thats the Belgian story. There is a lot of false pride in history that runs out the door once money is mentioned. But then again maybe I'm just a bitter old man. Max, coffee is never off-topic here. But I've noted that most European Starbuckses give you the coffee mug option. What I recall from the U.S. is paper or nothing. But I haven't lived there in a while so maybe it's changed. I did kill time one early morning in Antwerp about six weeks ago with a ceramic mug full of Starbucks. It's possible that Angry Birds were also involved. OK, so where are the folks sticking up for Hard Rock's rights as a private company to buy a privately owned building as long as it follows the rules for protecting that building and its appearance? Because I would have a hard time arguing with that. I've never been into one because for the prices they charge, I want to get table service and not stand in line, but I think they do give you mugs. Most Starbucks I have been in were the take-out spots inside grocery stores or bookstores. Having said that, the options in those joints tend to be paper, bring your own travel mug, or buy a mug from us. I guess they don't want to do any dishes. Any time I hear of a Hard Rock Cafe opening up I hear a voice in my head ask, "They're still in business?" In the case of the Grand Place, I liken it to serving Spaghetti-O's in a fine Italian restaurant. An elegant piece of writing! Funny I am in Brussels right now. I just ate at a local cafe. The menu said the pasta with pesto was 20 euro. So I thought this might be a good sized plate. Well the food came out and it was about the size of a small scoop of icecream. I would have given anything for a Hard Rock then. 20 Euro could have gotten me a beer and a large burger! Plus who cares? I say good on them for opening one up. At the time when people need a job anywhere in the world they are creating them. Forget your heritage because many of your cities statues are littered with spray paint. This is truely a sad sight for me visiting this wonderful city. Adventure as an Excuse for Beercation. Costa Rica Gets First Craft Brewers Association.